This NAACP Image Award-nominated late-night talk show is hosted by comedian and actor George Lopez. It’s the first talk show to be hosted by a Hispanic-American on an English-language network in the United States. Lopez also serves as Executive Producer. 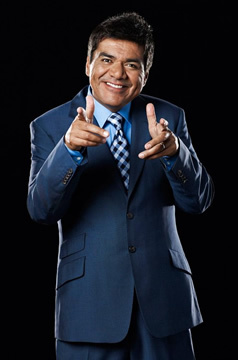 The show features Lopez’s everyman humor, with a tagline of “bringing the party back to late-night” as he goes without a desk and cue cards. Lopez does stick to a typical late-night format in the hour-long show, starting it off with a monologue, then follows it up with audience interaction as he interviews known celebrities and new talent. Some recurring sketches include “Bullet Wound or Not A Bullet Wound” which involves different ethnic groups asked primarily racial questions and “Creepy Little White Girl” where a small girl rises from the audience to deliver bad news to the host. The house band, The Ese Vatos, is led by Michael Bearden as musical director. It also features drummer Robin DiMaggio, guitarist Tommy Organ, percussionist Lenny Castro, bassist Alex Al, horn player Bill Churchville, and saxist Sean Hill. The final episode guests were actress Eva Longoria, host/actor Arsenio Hall, basketball players Ron Artest and Derek Fisher, musicians Slash and Sheila E., and comedian Russell Peters. Lopez finishes the show talking about how inclusive he tried to make the show. He also thanks his friends, guests, co-workers, fans, Sandra Bullock (for taking a chance on him 11 years earlier), and band leader Michael Bearden. First aired: August 12, 2011.